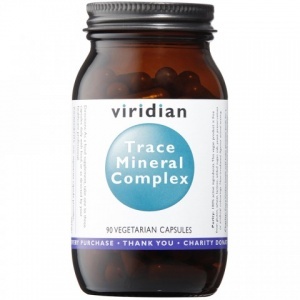 Trace minerals are essential for many processes in the body. Soil depletion and a busy lifestyle can mean that vital trace vitamins and minerals can be left out of the daily diet. Manganese contributes to the normal formation of connective tissue and aids in the maintenance of normal bones. Manganese also has a role in the protection of cells from oxidative stress. This 'oxidative stress' appears to be a major factor in many human diseases. Selenium contributes to the maintenance of normal hair and nails, the normal function of the immune system, normal thyroid function and for the protection of cells from oxidative stress. Selenium also contributes to normal spermatogenesis (the creation of sperm). Copper contributes to normal energy-yielding metabolism, the maintenance of normal connective tissues, to the normal pigmentation of hair and skin, the normal function of the nervous and immune systems, and for the protection of cells from oxidative stress. Manganese (bisglycinate) 15mg, Selenium (L-selenomethionine) 200ug, Boron (sodium borate) 1mg, Copper (citrate) 1mg, Chromium (picolinate) 200ug, Molybdenum (ammonium molybdate) 200ug, in a base of alfalfa, spirulina and bilberry.